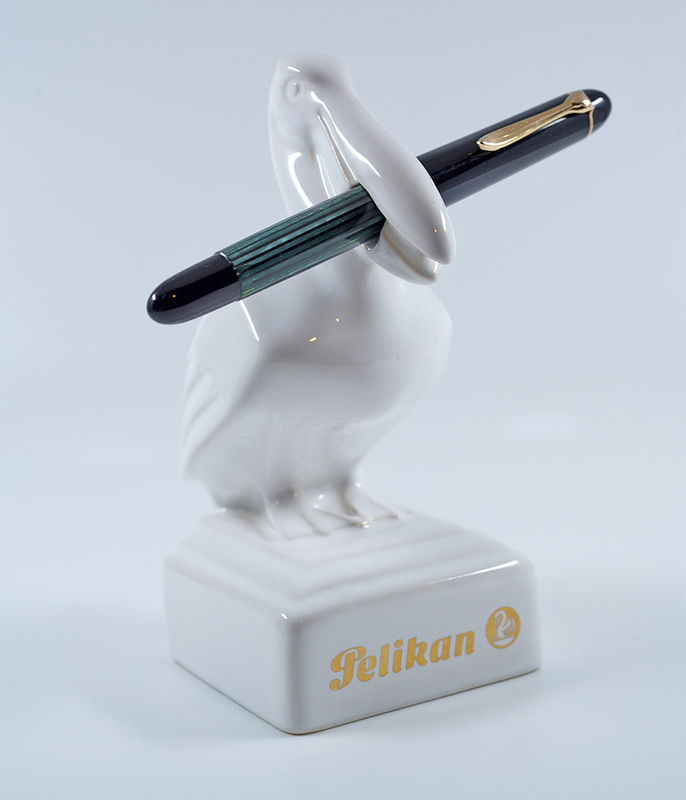 The Pelikan 300 fountain pen represents a cross between the 140 and the 400, both of which were contemporaries. The 300 has a barrel length equal to that of the 400 along with a cap and piston knob done in the style of the 140. In fact, a 300 can be constructed from components of the two pens as outlined above which means that you should carefully scrutinize any potential 300 before purchasing in order to verify its authenticity. The cap band usually bears the inscription “Pelikan 300 Pelikan 300 Pelikan 300” and the barrel frequently reads “Export Pelikan 300 Günther Wagner Germany” just above the piston knob. 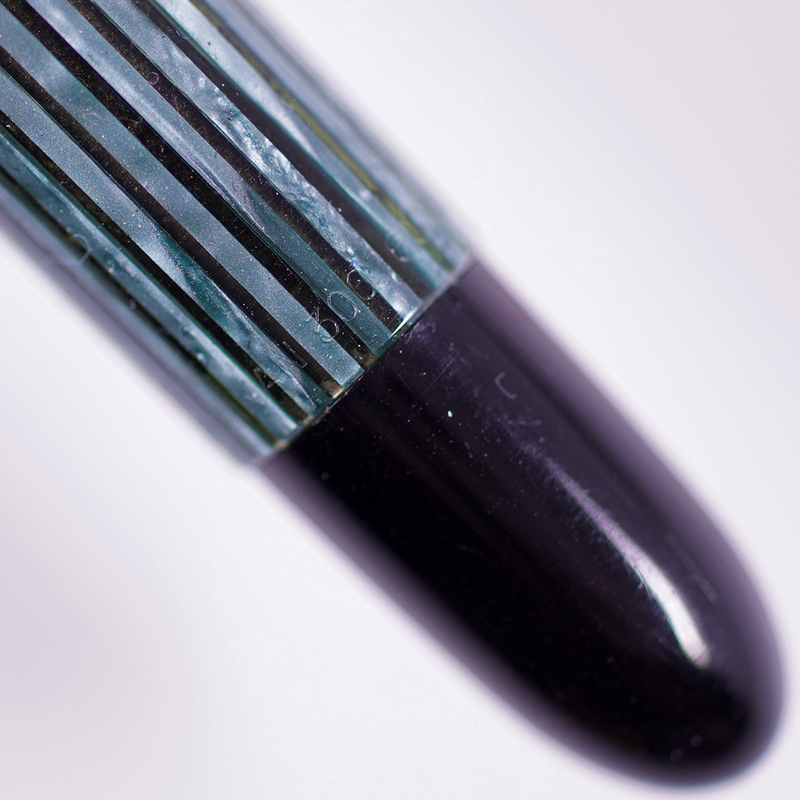 Both markings identify the pen as a true 300 though there have been a few seemingly genuine examples found that lack an inscription on the cap band or omit the word “Export” on the barrel. The cap top is either smooth and without a logo or depicts the two chick logo in use at the time (both are correct). The nib is taken from the 400 and can be found in either script or logo variants depending on early versus late production. Regardless of which style, you will generally find them in 14C-585 gold though a few examples have been noted with 18C nibs, likely due to market requirements (e.g. France) at the time. Pelikan Schreibgeräte tells us that these were predominantly sold in Switzerland and in the Scandinavian countries of Denmark, Norway, and Sweden (based on available brochures). 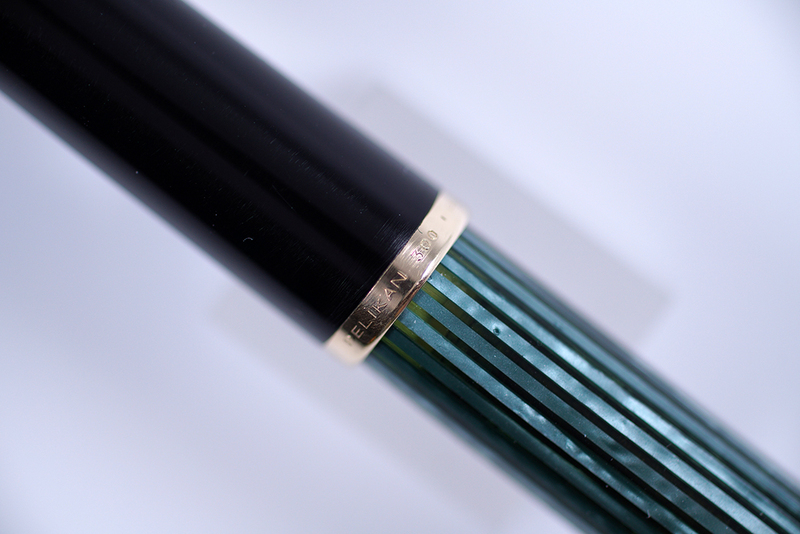 Of course care should be taken not to confuse the 300 with the Gimborn 150, a near identical pen made by Pelikan under the name of a Dutch brand that Pelikan had acquired in 1931. Production of the 150 spanned the same time frame as the 300. While they may be mistaken for one another at first glance, they are actually fairly easy to tell apart. The 150 was equipped with a different clip, a tear drop shape reminiscent of the 100 and 100N. There is no engraving on the cap band and there is no logo on the cap top of the 150. As might be expected, there will be no Pelikan branding anywhere on the Gimborn version. “Gimborn” can be found inscribed on the barrel near the piston knob as well as on the nib which is engraved “Gimborn 14KT”. If all else fails, the 150s came in solid colors where the 300 was generally available only in striped variants. My own take is that the 300 is a very desirable pen which I count as one of my personal favorites. 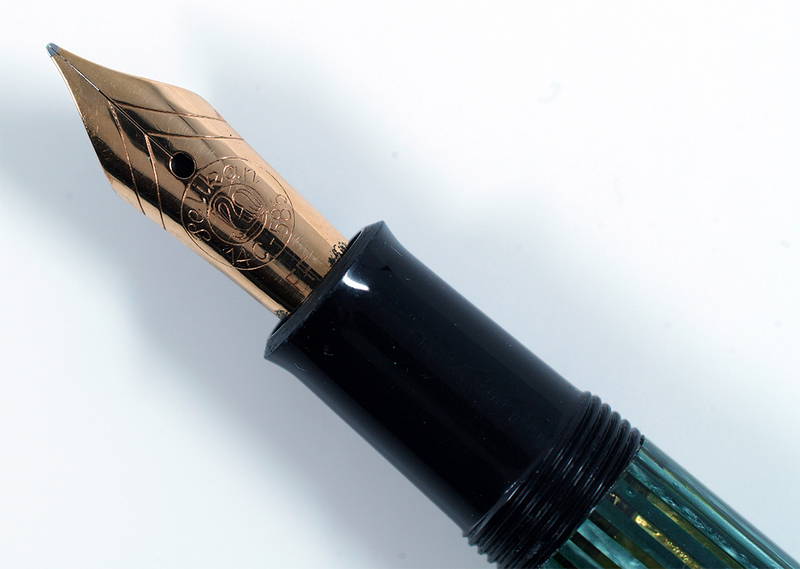 I hold the 140 and 400 in high esteem, ranking them amongst the models that I recommend most to anyone looking to jump into a vintage Pelikan fountain pen. Taking the profile of the 400 which is incredibly comfortable in the hand and pairing that with the styling of a 140 makes for a hybrid that delivers on both looks and performance. 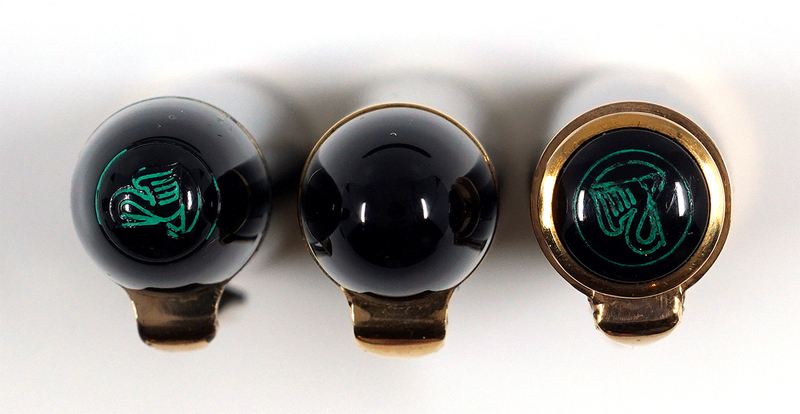 Pelikan’s vintage nibs are expressive and springy, making them second to none in my humble opinion. While not commonly encountered, I would encourage anyone to think twice before passing up the opportunity to pick one of these up. Many thanks for filling a gap in my personal book of Pelikan knowledge. 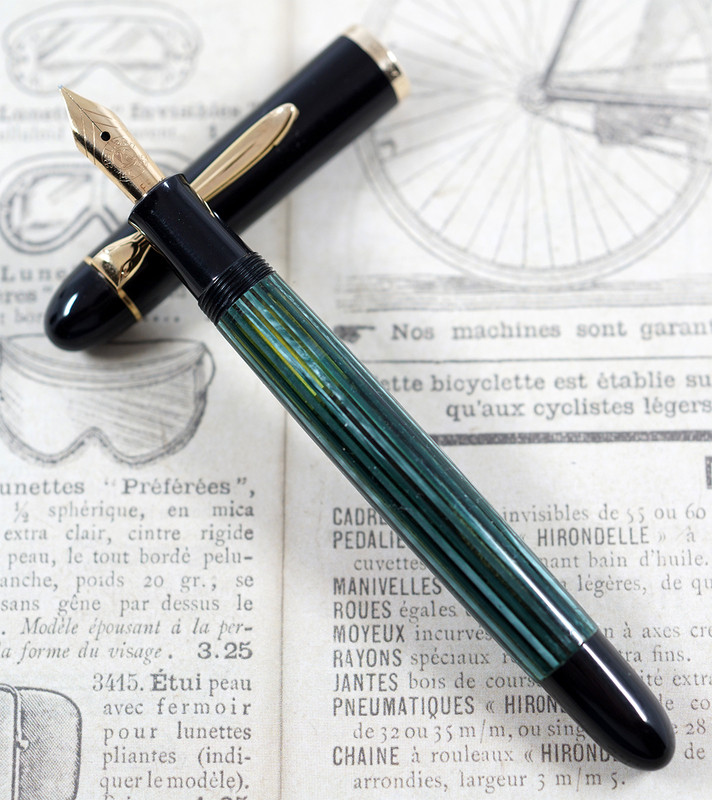 Lovely article about a great pen, Joshua! Thanks for sharing. 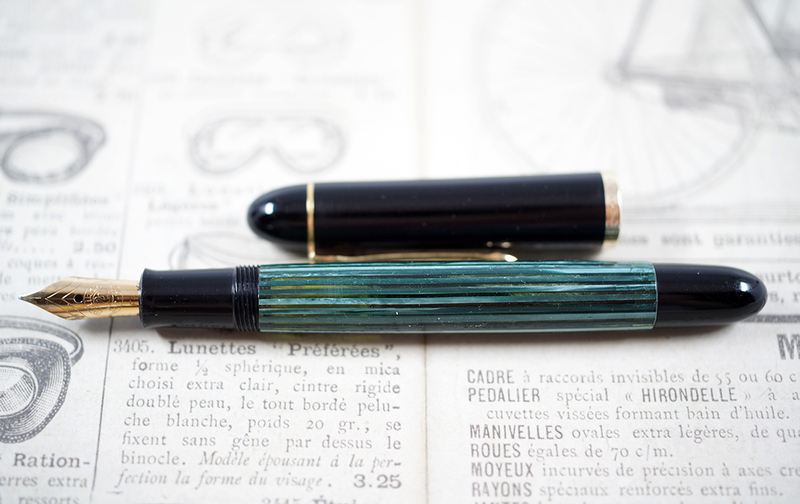 I only recently started to venture into vintage Pelikan. But, I was lucky to get on of these in mint condition at last year’s DC show (with box and papers). It sports a lovely B stub nib, which is a joy to use. But I didn’t know they also came in all black — those must be hard to get. Glad you enjoyed the article. I found my 300 at the D.C. show as well. Can’t wait to see what trouble I can get into there this year. Beautiful pen. Didn’t know these were out there. Thanks. Glad to be able to expand your Pelikan knowledge. Informative and very interesting as always. Thank you.